Introducing opening night of Transatlantic Love Affair's newest creation The Privateer, TLA company member and first-time director Derek Lee Miller humbly said, you don't want to hear me lecture about pirates for an hour and a half. As someone who quite enjoyed listening to him lecture about bananas for an hour this summer, I most certainly do want to listen to Derek Lee Miller lecture about pirates! Because it would be sure to be fascinating and educational and delightfully nerdy. But even better than a lecture, this excellent company tells a story about pirates through movement, words, and music. TLA fans are sure to love this new, exciting, dangerous tale. And if you haven't seen TLA before, what are you waiting for?! The plot of The Privateer goes something like this: in the early 18th century American colonies, a bored rich man (loosely based on this guy) decides he wants to go to sea and have adventures. He asks the governor for permission to become a privateer (which sounds like a sort of legal pirate) and is denied, but that doesn't stop him from buying a ship, hiring a crew, and setting sail. They have some marginal success despite the captain's ineptitude, until they run into a Spanish war ship, and the pirate from which legends were born - the infamous Blackbeard. Incompetent idiot vs. experienced pirate, and you can guess how the story goes. But despite the sad ending, along the way there is much adventure, swashbuckling, and amusement. 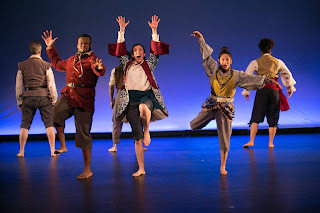 TLA is an ensemble based, devised, physical theater company. Which means that the show is created by the company during rehearsals, and their only tools are their bodies, voices, and expressions. 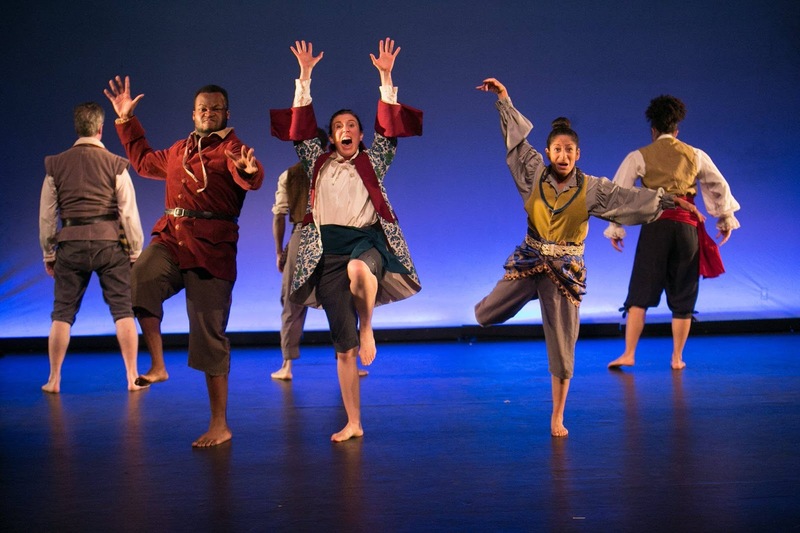 The Privateer ensemble includes company members Allison Witham, Eric Marinus, and Heather Bunch as well as TLA newbies Antonio Duke, China Brickey, John Stephens, and Nora Montañez. TLA has a strong core company, and it's wonderful to see them bring new people in and teach them their style, as well as learn from them and incorporate their unique skills into the creation. The ensemble creates the entire world of the play on a bare stage. Typically they're dressed in neutral costumes, but for this show there are some fancy coats, vests, and sashes to allude to the pirate theme. Like pirate neutral (costumes by Mandi Johnson). Because then they can create multiple characters, distinguishable by the way they carry themselves and the way they speak. In addition to characters, the ensemble members portray everything from the waves of the ocean to the furniture. Perhaps the most delightful delightful scenes are the swordplay with no swords, just the gestures and movements of the actors that make you think you can see the swords. Everyone in the ensemble is so interesting to watch, but of particular note are Heather Bunch as the clueless privateer wannabe, Allison Witham as the fierce Blackbeard, and John Stephens as the trusty first mate. And there's music too! Percussionist Dustin Tessier creates a soundtrack so organic you almost forget he's there. The ensemble sings a few pirate songs too. The lighting is another character in the play, helping to set the tone (designed by Michael Wangen). 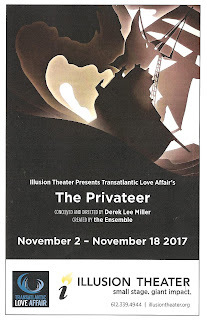 The Privateer plays Thursday through Sunday evenings through November 18. Transatlantic Love Affair is a unique company in the #TCTheater scene, and The Privateer is another beautifully clever show in their growing repertoire.